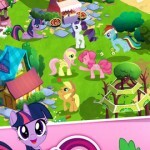 Tags: Adventure, Cool, Fantasy, Fun, Girl, Horse racing, Kids, Magic, Magical, Unicorn. So girly, the perfect app for unicorn lovers! What’s not to love about magic and unicorns! 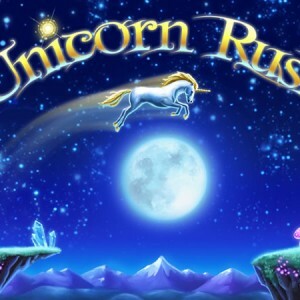 I really liked this fast paced game starring a gorgeous white unicorn. Unicorns are like horses but way more amazing. I think this app will appeal to girls and boys of all ages. Its fast paced and has so much to offer. I loved the overall look of the game. Its set at night under a bright full moon, and the graphics are really moody with lots of silver, green and blue. It creates a mystical scene that will appeal to anyone who loves fantasy, castles and romantic knights in shining armor. 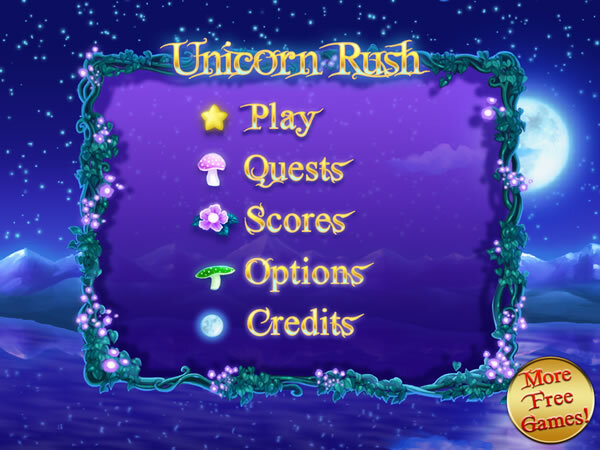 Unicorn Rush is really easy to play. It starts off with a tutorial game with simple instructions that pop onto the screen to help guide you as you play. I liked this function a lot. It makes it so much easier than reading long directions. 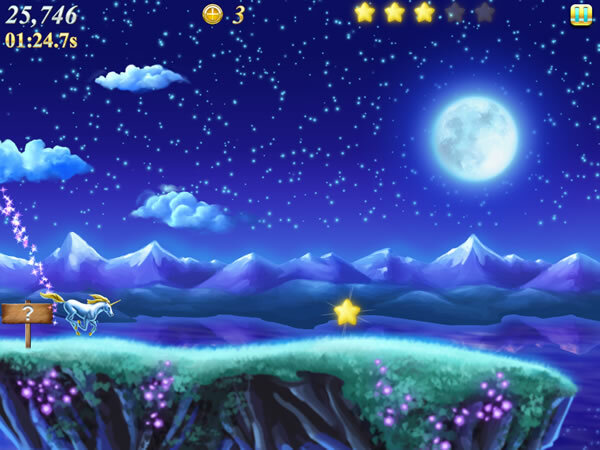 You tap the left side to make your unicorn jump, and tap the right side to shoot magic fireballs at rocks and crystals in your path. In the game, you want to get as many stars and coins as you can to reach the next level. Rocks and crystals are sometimes sticking out of the ground and getting in your way. Blast those awayand keep jumping over cliffs to stay on your journey. 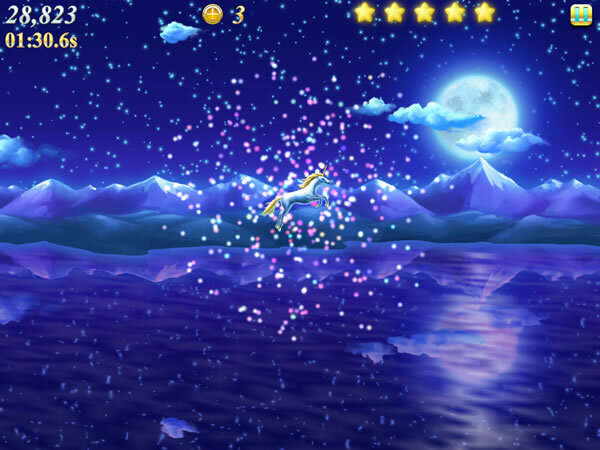 If you don’t jump high enough or if you slam into a rock, your unicorn falls into the cold water below with a big splash. This part is sad, but then you get to start over again in the same level until you beat it. I think the game will appeal to teens with its multi-level play, and it is easy enough for younger players to get a hang of. Also, it doesn’t feel like a free app. I can’t stand free apps that have ads everywhere and options to download other games. This app doesn’t do that. Also, you don’t feel like you need to constantly buy more coins or other stuff with real money. Some of my favorite things about this app are the magic mushrooms. They give your unicorn special powers and change the background. Like when your unicorn eats a pink one, the ocean turns pink as well. I thought this was so cool! Also, each level varies slightly to make the overall game fun and exciting. 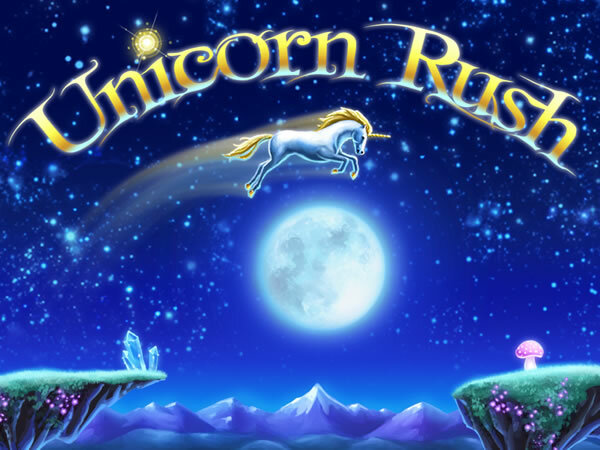 The only bad thing about Unicorn Rush is that it’s totally addictive. I can’t stop playing it. It doesn’t take long at all to get into the game. The shop does offer very tempting magical potions that you can buy with real money, but you don’t really need it unless you get to the really high levels. 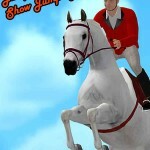 I usually like apps where you can groom and feed your horse, but I liked watching my white unicorn run and jump onto cliffs and shooting magic fireballs. I loved its rainbow mane fluttering in the wind. 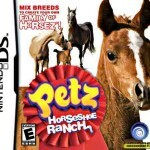 After I got past the first level, I forgot all about wanting to give my hay to my unicorn and kept playing and playing.